As Swachh Bharat Mission-Gramin moves steadily towards 100 per cent success, according to Ministry of Drinking Water and Sanitation (MDWS) records, it seems supplying water to rural areas has taken a back seat. But, water is what’s most needed to sustain the open-defecation free (ODF) status. 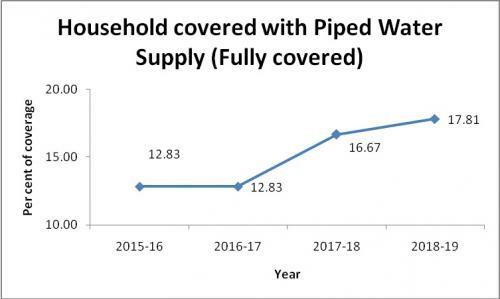 According to a 2018 report by Comptroller and Auditor General (CAG), the MDWS had promised to provide piped water connections to 35 per cent of rural households. But, the ministry’s records till April 1, 2018 show that less than 20 per cent of rural households have got it. This is when the ministry in 2017 launched a scheme to provide safe drinking water — Har Ghar Jal. But this seems to be a distant dream. The ministry also wanted to increase drinking water supply in rural areas to 55 litres per capita per day (lpcd). But, less than 50 per cent of households receive this amount. The old supply rate was 40 lpcd and almost 80 per cent of households get it. According to the CAG report, which analysed the state of rural water supply between 2012 and 2017, 4.76 lakh habitations had slipped from fully-covered to partially-covered state. The number of slip-back habitations was high in Andhra Pradesh, Bihar, Karnataka, Jharkhand, Odisha, Rajasthan, Uttarakhand and West Bengal. 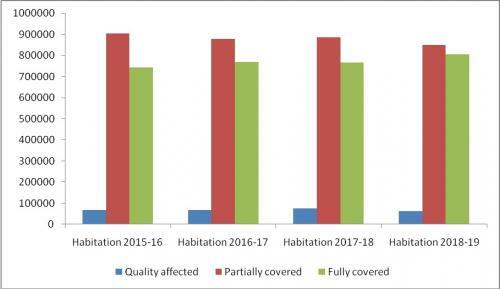 A Down To Earth analysis of the coverage of habitations by piped water supply with respect to supply of 55 lpcd shows that between 2016-2017 and 2017-18, there was a decrease in number of habitations in fully-covered status with a rise in those in partially-covered and quality-affected statuses. One of the major reasons behind this can be over dependence of piped water supply on groundwater supply – piped water supply from groundwater is almost seven times more than surface water supply. The CAG report also excessive extraction of groundwater, inadequacy of efforts to address quality related aspects, lack of sustainability of water sources, and inadequate or non- maintenance of water supply schemes for this reduction. India will soon be achieving an ODF status, but to make this state sustainable there should be piped water supply in rural households. It has been seen again and again that people do not prefer using toilets in areas where there is no supply of water — the villagers concentrate on collecting drinking water and not water for toilets. So constructing toilets does not mean end of job, safe sanitation needs a sustainable source of water for all purposes.